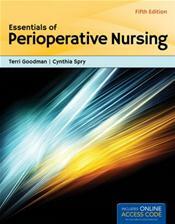 Abstract: Essentials of Perioperative Nursing, Fifth Edition is the ideal reference for new perioperative nurses as well as experienced nurses who need a refresher. Featuring objectives, course outlines, testing tools, and competency checklists, it is succinct and easy to use. Completely updated and revised, this new edition includes an introduction to the current clinical environment, elements of a culture of safety, and patient care unique to the ambulatory care setting. Essentials of Perioperative Nursing, Fifth Edition is perfect for operating room nurses, nurses studying to become operating room nurses, current operating room nurses needing to refresh and test their knowledge, and perioperative nursing students.